Vast Public Indifference: 101 Ways, Part 91: "Quitted the Stage"
This is a fairly famous stone — that is, it appears in more than one book on New England history/literature, where people of extreme nerdliness may have come across it. 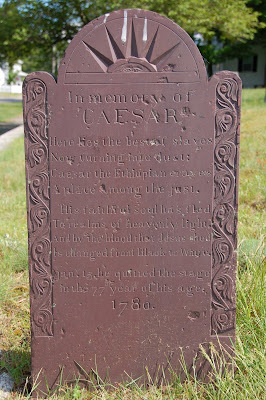 It is a replica of the original stone dedicated to Caesar, a slave belonging to the Maxcey family of North Attleboro, MA. I don't know whether it stands in exactly the same place as the original — if it does, it is somewhat unusual in that it is not relegated to a far corner of the graveyard. A place among the just. in the 77th year of his age. For an excellent discussion of imagery of racial transformation through salvation in 18th/19th-c. New England epitaphs, see John Wood Sweet's Bodies Politic: Negotiating Race in the American North, 1730-1830. If you wish to visit Caesar's grave, it is in a little graveyard on Rte. 1 in North Attleboro, MA, just a few miles north of the junction with 295.